The BBC's weekly The Boss series profiles a different business leader from around the world. 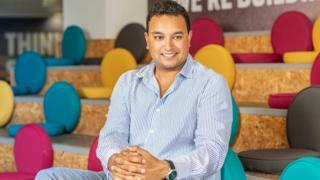 This week we speak to Samir Desai, founder of peer-to-peer lender Funding Circle. But that is ultimately what happened after Samir Desai first discussed his big vision with two old university mates when they met up for a few pints in a bar in central London in 2008. The situation looked hopeless for small firms, but Samir - then a 26-year-old management consultant - had come up with what he thought was a good idea. He wanted to remove the banks from the equation, and instead allow the companies to more easily borrow funds from elsewhere. Specifically he wanted to create an online marketplace where small firms could apply to borrow money from a pool of funds supplied by individuals and other businesses - peer-to-peer lending. Samir's friends from his Oxford University days - James Meekings and Andrew Mullinger - both agreed that it was potentially a great idea for a business, so the three of them decided to research its feasibility. In 2009 they quit their jobs and started work on Funding Circle, which then launched in 2010. Earlier this month, the company became the first lender of its type to float on the London Stock Exchange, and is now valued at more than ￡1.3bn. An impressive figure, albeit down from its initial listing price of ￡1.5bn with analysts saying the flotation may have overpriced the firm. Samir, now 35, says he came up with the idea for the company because even before the financial crisis "small business lending was pretty broken". "It took 15 to 20 weeks to get a loan [from a bank]," he says. "And I came to realise that actually only a very small part of what a bank does is small business lending - it [can be as low as] only 5%. "But small businesses are quite a big deal to society - they employ 60% of the private-sector workforce, so there's a big disconnect on how much banks care about lending, and how much society cares." To get London-based Funding Circle up and running, the three friends put ￡60,000 of their combined savings into the business. James had also previously been a management consultant, while Andrew had worked in risk management. The three friends also raised ￡700,000 from a dozen investors, including friends, and friends of friends. The funds enabled them to build the technology platform behind the website, and to then market and launch the business. "It was interesting in the early days," says Samir. "It was like the chicken and the egg - which comes first, the business or the investor?" To attract early investors the company offered them a "cashback" deal, whereby if the money they were lending via the website was due to pay them 7% interest, Funding Circle would increase this to 9%, and pay the investors the other 2% from its own funds. To gain small business customers, Samir and his co-founders would send out letters. So much so that he says they ended up breaking the printer they had borrowed from James's dad. User numbers on both sides then started to slowly grow, and in 2011 Funding Circle secured ￡2.5m in venture capital funding. This then rose to ￡250m, prior to this month's flotation. It hasn't made a profit yet though, but Samir says that this is deliberate, because the company has been investing heavily in expansion. "The business continues to grow rapidly," he says. "From our perspective we want to be the first choice for small businesses globally." Last week, the firm announced that loans arranged via Funding Circle totalled ￡2.8bn as of 30 September, up 61% from the same date last year. The company did not, however, unveil any new turnover or profit and loss figures. Instead, the most recently available show that it had annual revenues of ￡94.5m in 2017, up from ￡50.9m in 2016. Meanwhile, the pre-tax losses in 2017 totalled ￡36.3m, compared with ￡47.2m a year earlier. The company's share price also remains below the level at which it floated on 3 October. "The peer-to-peer lending sector is relatively new and few companies within it have been through a severe economic downturn, which means there is a higher level of uncertainty about how these businesses will fare in difficult market conditions. "The risk is that in a poor economic environment borrowers default on their loans in large numbers, and this will put the credit and risk mitigation methods within lending platforms to the test." Meanwhile, the BBC's business editor Simon Jack has questioned whether Funding Circle and its rivals could be harmed by a proposed regulatory tightening of the peer-to-peer lending sector in the UK. The regulator, the Financial Conduct Authority (FCA), is considering rule changes that would only allow very wealthy personal investors to use Funding Circle and its rivals in the future. The FCA's concern is that an investor's capital is potentially at risk. "We're getting more and more repeat customers," he says. "Investors are quite excited about the market size growth rates, high margins, and the scale of repeat customers."